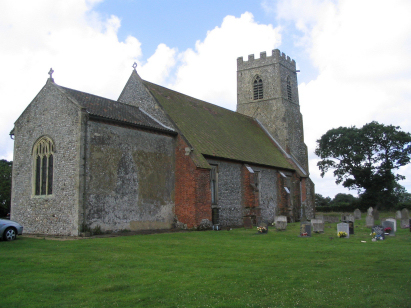 The parish of Bodham lies in northern Norfolk quite close to its northern coast and about 3 miles east of the small market town of Holt. Bodham has its main group of properties along and just south of the busy A148 road which connects Holt with the seaside resort of Cromer. Bodham sits on quite high ground, a glacial remnant, for this part of Norfolk and much of the land was heathland prior to the early 19th century. Agriculture would have been the mainstay of the economy and most of the land is under arable fields today. A smaller settlement of Lower Bodham and, indeed, the church stands almost a mile south of the present village centre. 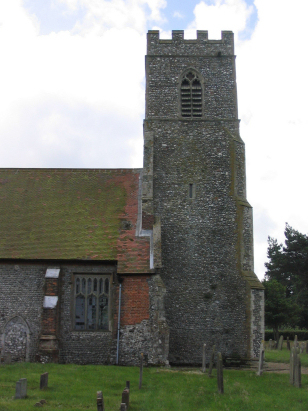 All Saints church sits on its little narrow lane a mile south of the A148 and separated from Bodham village by the shallow valley of the infant River Glaven. The church has its origins in the 14th century and there is much use of the Decorated style of architecture to indicate this. Pevsner cites the western tower, southern porch and chancel arch as examples of this date. He also notes that there were extensive repairs in the early 17th century and at least 3 major restorations (1859, 1893 & 1921) which have altered most of the external appearance of the church. The church stands close to a farm but more or less surrounded by large fields, the site is enclosed within hedging with a gap for a parking area. There are few obstacles in the churchyard so photography in unrestricted. A single standard 00-entry register book covers the period of this transcript and runs on to finish in the early 20th century. This register is split across two films - MFRO342 finishing on MFRO343 - and they were used to prepare this transcript. Apart from a little period when entries are clearly out-of-sequence and probably retrospectively completed there were few issues in preparing this transcript. Hopefully few errors will have resulted.